Be the first to share your favorite memory, photo or story of Harris. This memorial page is dedicated for family, friends and future generations to celebrate the life of their loved one. 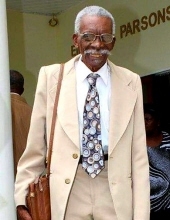 We regret to announce the passing of Harris W. Ronan who passed away peacefully at his home in St. Thomas, VI on Wednesday, February 6, 2019 at the age of 97 years. Special Friends: Members of the Church of God of Prophecy in the British Virgin Islands and the US Virgin Islands. Viewing will be on Wednesday, February 27th, 2019 at the Celestial Chapel of Dan Hurley Home for Funeral's, in St. Thomas, VI. from 5 pm to 7 pm. Funeral Service will be on March 9th, 2019 at the Zion Hill Methodist Church in West End, Tortola, BVI. Viewing will begin at 10 am and the service at 11 am; burial will take place at the Ronan/Leonard's Burial Ground in Towers, West End, Tortola, BVI. To plant a tree in memory of Harris Walter Ronan, please visit our Tribute Store. "Email Address" would like to share the life celebration of Harris Walter Ronan. Click on the "link" to go to share a favorite memory or leave a condolence message for the family.